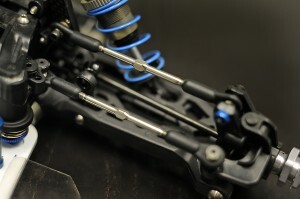 Can you tell me why we are running 1/8 scale linkages on our 1/10 scale trucks!? It’s not needed, and the stock OEM parts wear out way to quickly anyways. Meet the best of both Worlds; with this combo you get the lightness (ounce lighter than OEM) and durability/longevity of USA Made Dubro/Lunsford components. Just what your SCTE has been craving. Direct replacement from stock drives! Improved handling and control of your SCTE.